SaniGirl for women & My Little Helper for girls. Two different designs for two different bodies. Both come in sleek reclosable packs of 10. Each unit is packed ready to pop open & use. Both the product and packaging are eco-friendly & 100% recyclable. Stylish design, super compact, easy to use, & works great. With a combo pack all can stay clean and worry free on the go! 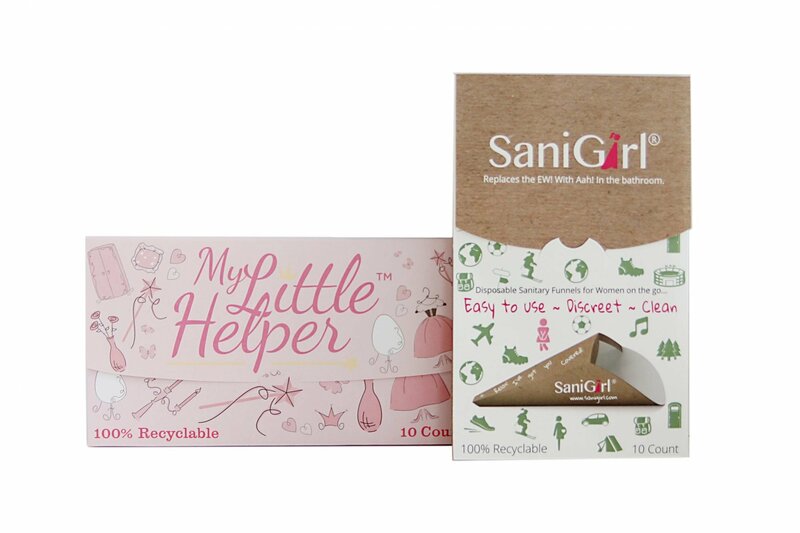 Both SaniGirl® for women, and My Little Helper® for girls, are made of the same top-grade reinforced industrial composite paper which is coated inside and out with a leak-proof barrier to ensure a secure and waterproof construction. Both are disposable and recyclable. Both products come in convenient envelope style packs of 10 units. Each funnel is approx. 7”L x 4 3/8”w (17cm L x 11w) and is the thickness of a card. The 10 pack MLH dims are: 7”L x 4”H x 3/8”Thick (18 ¾ cm L x 10 cm H x 1cm thick). Both products are packed ready to just pop open and use.